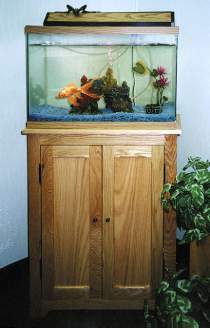 This stand was designed to hold a 20 gallon aquarium, but also makes a nice display cabinet. Store fish food and aquarium cleaning supplies on shelves concealed behind the two doors. Measures approximately 32"H x 24"W x 13"D. Order #1025 Aquarium Stand hardware parts separately. Aquarium Stand Hardware includes two pair of hinges, two knobs, two magnetic catches and shelf supports. Project plan, wood and wood finish are not included.